Cardi B has been making her rounds during Paris Fashion Week and on yesterday(September 25th) she performed during the ETAM womenswear Spring/Summer 2019 runway show in Paris. 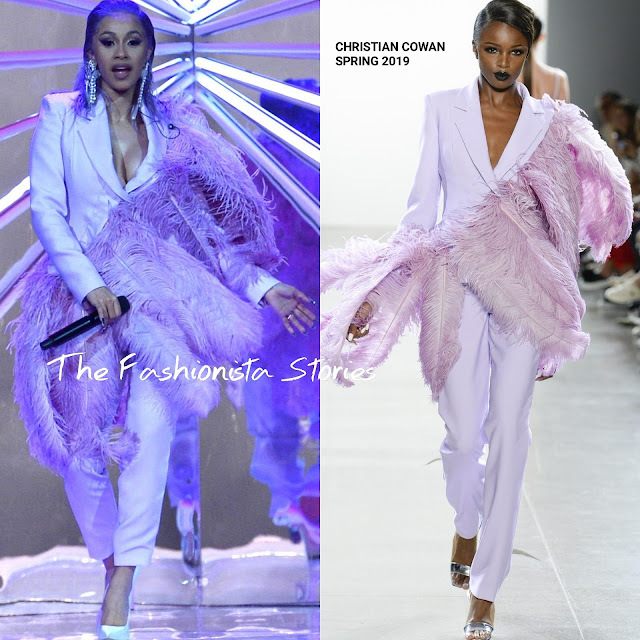 Cardi is known for her interesting fashion choices so seeing her in this CHRISTIAN COWAN SPRING 2019 lavender feather suit is no surprise. I am not sure how this would fair on someone else but for Cardi, it was a fun choice that suits her style. She finished up with matching pulled back tresses and CASADEI pumps. Are you feeling Cardi's feathered look?